More than 300,000 unified communications-as-a-service (UCaaS) subscriber seats were added to the global installed base during the second quarter of 2018, amid market growth of 25 per cent year-on-year. New findings from Synergy Research highlight a market going mainstream, driven by increased adoption by large enterprise customers for the tenth success quarter. 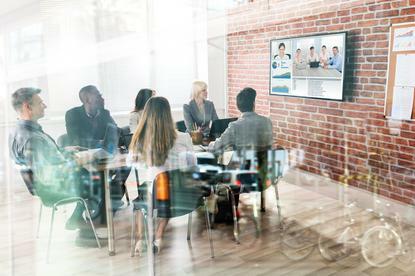 “UCaaS is going mainstream now and we are seeing strong uptake by larger enterprises, while mid-market growth remains robust and SMB growth rate is tailing off a bit,” said Jeremy Duke, founder and chief analyst at Synergy Research. “With UCaaS penetration of the PBX market still running at under 10 per cent, there remains a long runway for substantial UCaaS growth over the coming years. While early adoption of UCaaS was driven by small-medium businesses, Duke said this segment still accounts for the largest share of the market. Looking ahead however, Duke said the market is moving increasingly to large enterprises where subscriber growth rate is now more than double that of SMBs. From a vendor perspective, RingCentral and Mitel “remain locked in a battle” for market leadership and between them account for over a third of the total market - they are followed by 8x8, Cisco (Broadsoft) and Vonage. In aggregate the leading five vendors have a market share of over 60 per cent, with Duke cited smaller vendors with particularly high growth rates as Alianza, Fuze and LogMeIn. 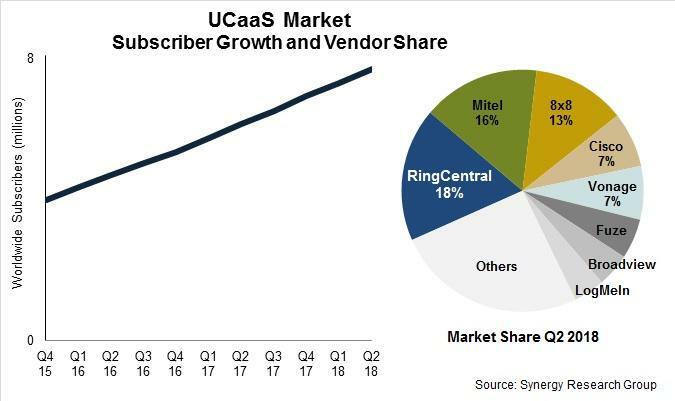 "UCaaS subscriber numbers are now approaching the eight million mark having double since late 2015, with the market split between retail and wholesale business models,” Duke added. On the larger retail side RingCentral and 8x8 are the leading providers, while in wholesale Mitel and Cisco/Broadsoft lead. Furthermore, Duke said the worldwide market continues to be dominated by the US, with market development still being in the early days in most other countries.